Our last training for 2018 will take place from 12am to 1pm on saturday, 15th of december in Sporthalle Kolping-Währing (1180 Wien, Gentzgasse 27). Our first training in 2019 will take place from 12am till 1:30 pm on saturday, 12th of january in the Fritz Grassinger-Halle (1150 Wien, Tellgasse 3). Our Fritz Grassinger-Halle is still closed for renovation of the floor layed new last summer, still no information from the authority. Our next training will take place on november 10th in the Turnsporthalle Kolpinghaus Wien-Währing (1180 Wien, Gentzgasse 27). Training from 12 am till 1 pm, we meet at 11:45 in the lobby. Some of the Specials from Vienna went to Graz to support the specials steiermark in a match against specials Vorarlberg to celebrate the opening of a new sports-hall there (we could use some new facilities in Vienna as well). Our Fritz Grassinger-Halle is still closed for renovation. Our next training will take place on october 20th in the Turnsporthalle Kolpinghaus Wien-Währing (1180 Wien, Gentzgasse 27). 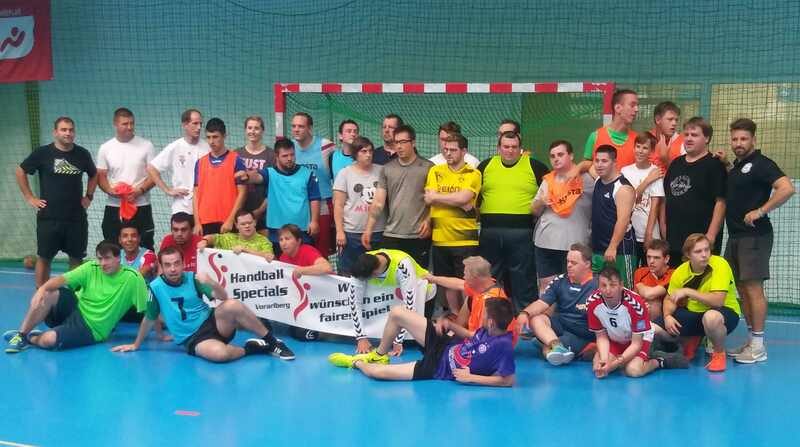 On August, 31st, the Handball-Specials from Vienna had a trainingsession together with our colleagues from Vorarlberg and – for the first time – with the Rapid Specials-Needs Team. The players of Rapid got a gift from the European Handball Federation, a handball for each player. Foto by Johann Bauer, made in the ASKÖ Ballsportcenter Bernouliigasse. 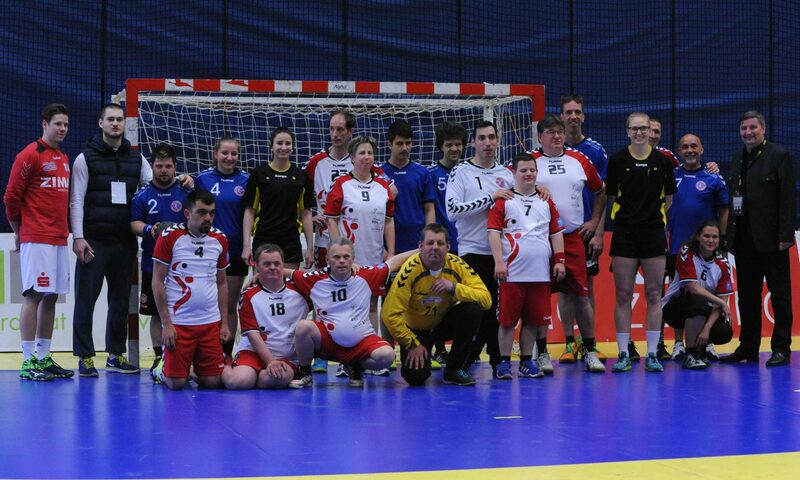 On September, 1st, we played in a team together with our friends from Graz against Vorarlberg in Krems. 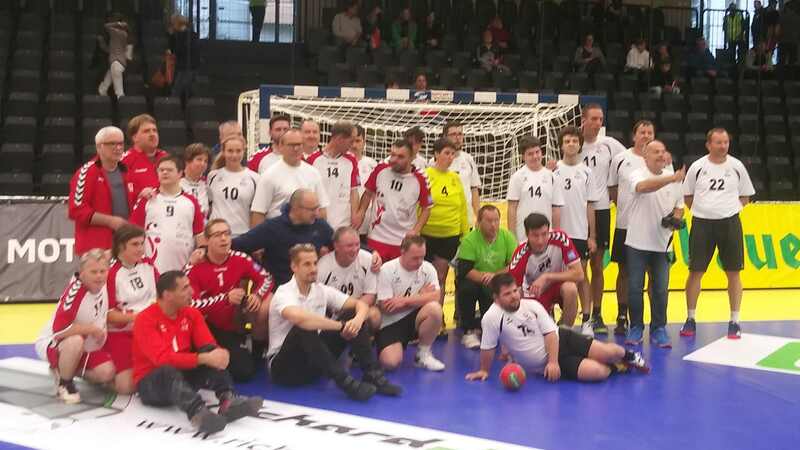 On saturday, september 1st we are going to play the Specials from Vorarlberg at 4 pm in Krems in a Unified-Game. We leave Wien at 11 am with a bus, make a short break in the Wachau (World Heritage), proceed to the sports-hall (3500 Krems, Strandbadstrasse 3) and play. After our match, at 7 pm there will be the match between hometeam Moser Medical UHK Krems and ALPLA HC Hard from Vorarlberg in the first game of the spusu HLA mainround, juniors of both teams will play at 5 pm. Due to complications with the new floor the Fritz Grassinger-Halle (1150 WIen, Tellgasse 3) will also be closed in september. We hope to be able start training in october! We are leaving the sportshall for summer and take a handball-break. We restart our training in september, most likely on the 8th. If possible, we will play the Handball-Specials Vorarlberg (our colleagues from behind the big mountain) during the Schmelz-Turnier, the biggest Austrian youth handball tournament. The Vorarlberger Specials will come to Vienna in early september. We definitly will play against them, and afterwards visit a Heurigen together. We plan a trip to Rovinj (Croatia), were we will be invited by the Mateo Kovacic Foundation again. And of course take part in the Handballmarathon Graz 2019. We played two games at the event handball-marathon Graz 2018, and here is the link to the video. We are very grateful to our unified-partners, in the first game two ladies from “Hooters”, one of the sponsors of the event. In the second game two young players from the local handball club UHC Graz. The Handball-Specials Wien took part in the charity-event “handball-marathon Graz 2018“, where teams of amateurs and professionals, of men and woman, of kids and seniors, of competitive teams and fun-teams played handball for 24 hours to raise money to help families in need. This years event was to support a girl (7 yrs) with Di-George-Syndrom and a boy (2 yrs) with Angelmann-Syndrom.